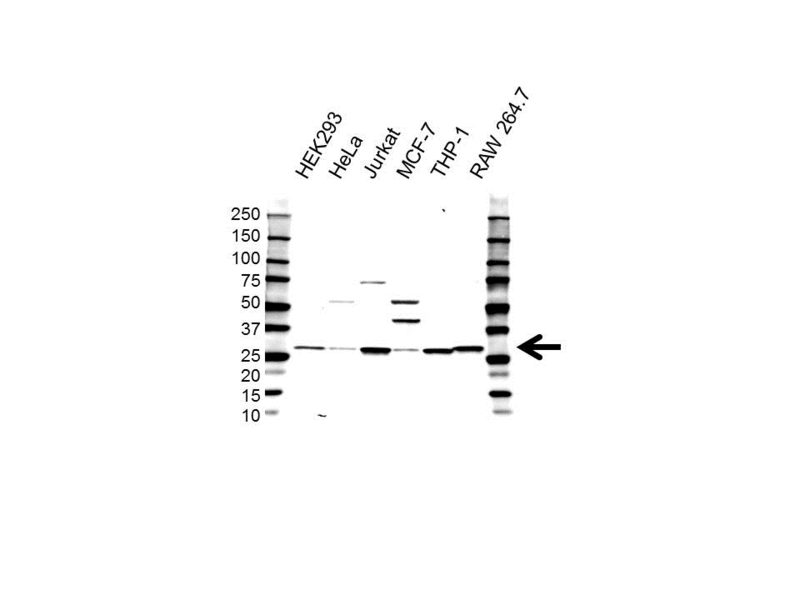 Rabbit anti-human high mobility group protein B2 antibody recognizes high mobility group protein B2, also known as HMG-2 or high-mobility group box 2. This antibody has been extensively validated for western blotting using whole cell lysates. Rabbit anti Human high mobility group protein B2 antibody recognizes high mobility group protein B2, also known as HMG-2, high mobility group protein 2, high-mobility group (non-histone chromosomal) protein 2 or high-mobility group box 2. HMGB2 gene encodes a member of the non-histone chromosomal high mobility group protein family. The proteins of this family are chromatin-associated and ubiquitously distributed in the nucleus of higher eukaryotic cells. In vitro studies have demonstrated that this protein is able to efficiently bend DNA and form DNA circles (Paull et al. 1993). These studies suggest a role in facilitating cooperative interactions between cis-acting proteins by promoting DNA flexibility. This protein was also reported to be involved in the final ligation step in DNA end-joining processes of DNA double-strand breaks repair and V(D)J recombination (Nagaki et al. 1998) (provided by RefSeq, Jul 2008). Rabbit anti Human high mobility group protein B2 antibody detects a band of 28 kDa. The antibody has been extensively validated for western blotting using whole cell lysates. Anti high mobility group protein B2 detects a band of approximately 28 kDa in HEK293 cell lysates. Rabbit polyclonal antibody purified by affinity chromatography. Please refer to the PrecisionAb western blotting protocol. Store undiluted at -20°C, avoiding repeated freeze thaw cycles.